All answers about roof tents | Rooftent.co.uk - All roof tents under one roof! Can a roof tent be mounted on my car? Can the roof of the car carry my weight (and that of my travel companions)? We get a lot of questions at Rooftent.co.uk, which is quite understandable since it’s not your everyday product. You will find the answers to some of the most frequently asked questions below. If your question is not listed or is the answer unclear, please do not hesitate to contact us. Of course, you are always welcome to visit the showroom in Baarn to view various roof tents. Do you only sell roof tents? Roof tents are our specialty, and we also supply all the accessories for roof tents — canopies, roof racks, camping sets, refrigerators, etc. In short, everything for a great road trip or vacation. Can roof tents be mounted on every car? According to the manufacturer, roof tents can be mounted on every passenger car or bus where roof racks can also be mounted. 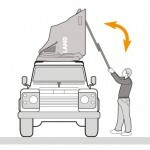 Use the Rooftent.co.uk service guide to get an indication of suitable roof tents. The maximum permissible weight of my roof racks is 75 kg. Is this a problem? All roof racks can support around 75kg which is sufficient for the weight of the roof tent (50-60 kg). The manufacturer’s advice is based on the load while driving. While stationary, the roof racks can handle up to 300 kg. The roof tents normally weigh between the 40 and 60 kg, so there is plenty of carrying capacity left for a few people. How fast can you drive with a mounted roof tent? With a roof tent on your car, you should not drive faster than the advisory speed limit (120 km/h). 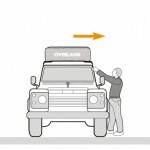 It is essential that the roof tent is installed following the manufacturer’s instructions. 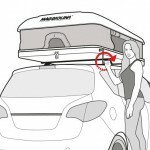 With both purchase and rent, the mounting of the roof tent is free of charge. How long does it take to set up a roof tent? All roof tents can be set up within a few minutes. You can leave the bedding, which allows you to create a comfortable sleeping place in no time. 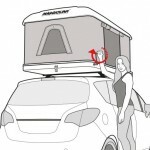 Does a roof tent increase the fuel consumption of the car? The fuel consumption of the car will increase slightly, but not significantly. This also depends on the speed of the car. At 120 km/h this will be proportionately more than at 90 km/h. Do I need anything else if I buy or rent a roof tent? The only thing that is needed for a roof tent is a car with roof racks. Do you have a car, but suitable roof racks? No problem, we have universal roof racks for every type of car, for sale or rent. Let us know the brand of car, type and year of construction before applying for rental or purchase. When in doubt, stop by our showroom, and we will advise you on the right roof rack. Is the rented roof tent insured? Rental objects (and their possible contents and accessories) are not insured by the lessor or the organization of the lessor, but fall under the own insurance (home contents, travel and / or car insurance) of the lessee. This also applies to damage to objects of the lessee or third parties caused by the use of rented object(s). For more information, see the general conditions. What do I get when I rent a roof tent? Daktenthuren.nl (part of Rooftent.co.uk) provides a complete package, so you can go (wild) camping carefree. A sturdy roof tent including mattress and ladder. 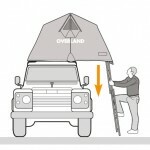 Some roof tents have the option to attach an extension tent, this can be rented seperately. 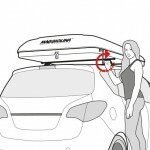 Daktenthuren.nl has the right roof racks in stock for almost every type of car. If you want to rent these, please mention this with the reservation request. Also provide the brand of car, type and year of construction. Where will my roof tent be stored? Your roof tent is stored at our location in Baarn. Are there pets allowed in the rental roof tents? No, pets are not allowed in the roof tent.